Anyone who’s seen Adam Sandler’s comedy “Happy Gilmore”, where a rejected hockey player finds he has more potential for golf, will appreciate the fact that the Latvian ice hockey star Sandis Ozoliņš owns the country’s most prestigious course. Part of the name “Ozo Golf Club” comes from his nickname in the NHL. 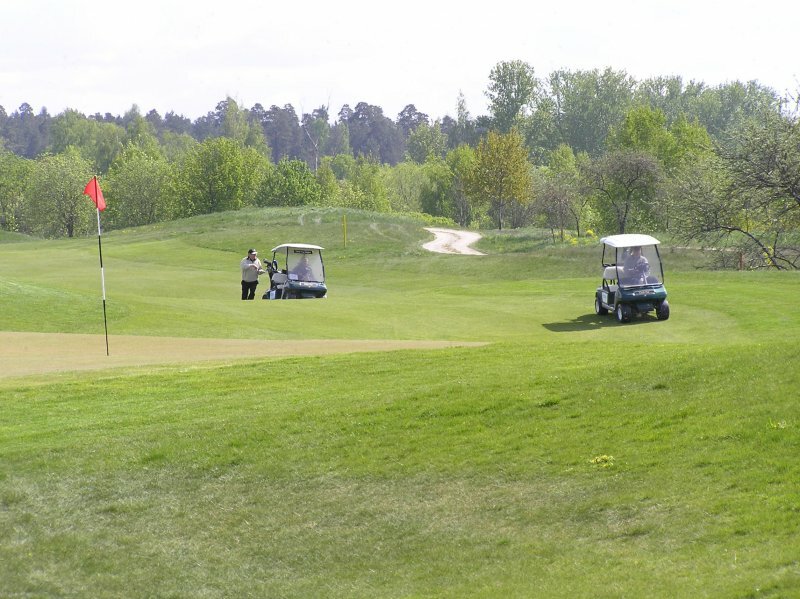 The club began operating six years ago and was the first 18-hole golf course in Latvia. As it’s one of the most technologically advanced courses in Northern Europe, it’s already popular with international guests as well as locals, and is the only course here to offer a professional tournament. In 2005, "Ozo Golf Club" received Latvian National Sport facility status, becoming the main education and training center for the Latvian National golf teams. When considering the quality of "Ozo Golf Club" on an international level, it's quite high. Although only first opened early this decade, in 2004 it was suggested among 365 courses in the world by "New York Times" golf reviewer Robert Sidorsky. In consideration of this and in comparison to the other clubs we visited, this club definitely has the most exclusive and serious sporting atmosphere on the course, where strict adherence to etiquette is observed. Only golfers with a Green Card can use the course. For those from countries with many public courses who are not so aware of this, a Green Card is like an official permit to use a golf course correctly, proving you at least know about the rules, have the minimal skills to play on a course, and will not lessen the enjoyment for others players. However if you are from the States or the UK for just a short visit, perhaps you can negotiate by showing your playing skills and knowledge regarding etiquette and rules, in order to be allowed to play for the day. The course was created by American designer Rob Svedberg, who has taken the shoreline of Lake Ķīšezers into account to make this course an attractive and challenging one. It's highly groomed fairways take a pleasant route through an adjacent forest and are quite hilly, which adds to the level of difficulty. There are 16 ponds and 50 sand bunkers to negotiate, with four par 3 holes, ten par 4's and four par 5's (total 72 par). The total course length is 5,902 meters from the yellow tees. For those wanting to fine tune their skills, the property also contains training facilities. There's a driving range for around 20 people to practice, with inspiring views of the lake in the background. You'd better not be afraid of wet weather as there are no shelters for these driving stations. There’s also a putting green and chipping green with enough space for groups and individuals. Artūrs Krukovs is a native Latvian and the only club professional. He took some golf teaching courses in the USA which he passed six years ago, and now he teaches mostly beginners and children according to local demand. However his English is quite good so there is no problem for international guests to take lessons. For beginners, Artūrs advises playing carefully, and thinking more about course management whilst not taking risky shots. The main thing is to enjoy the course and the surroundings, to look around and have fun when you play, which can improve the game. For those looking to test their skills, the lakeside holes, especially seven and eight, are the most challenging since the proximity to the water often makes conditions windy. Therefore less experienced golfers should especially play it safe around this area. Artūrs tells us that "Ozo Golf Course" manages club tournaments which take place on weekends as one day events. You don’t need to be a member, and there is a first come first serve opportunity to sign up for these, although places are reserved for club members. Then there are the three biggest tournaments. The first upcoming event is the LMT Latvian Amateur championship June 27th to 29th. The second amateur championship is the Hansabanka Latvian Open which will take place August 8th to 10th. As stated in the amateur golf rules of the R&A, which is the ruling authority of golf for all Latvia’s courses, prizes cannot be cash and can only be up to the value of 500 British pounds. These amateur competitions are on the schedule of the European Golf Association tournament calendar. For the professionals, Ozo Golf Club is currently the only Latvian course which hosts a tournament of this category - the Hansabanka Baltic Open, scheduled from July 25th to 27th. This is one of the biggest in Scandinavia, with prize money this year at €70,000, giving this tournament one of the richest purses for the third European level. For those not aware of these levels, the highest is the European Tour, second level is the Challenge Tour, and the third level tour includes local events like the Nordic League. In 2007, a full field of players participated in the Hansabanka Baltic Open, with around 150 professionals mostly from Sweden and Finland. Naturally, all this is very good for raising the profile of golf in Latvia and the region. The clubhouse is quite attractive and contains a pleasant restaurant "Bloom". This enjoys a good reputation for higher than average cuisine, and is managed by the group which runs other top city restaurants "Fabrikas" and "Melnie Mūki". It has as a good view of the driving range, an excellent terrace area to enjoy the sun, and a cozy bar area where you can admire the plaques of those who managed a hole in one. Holes six or thirteen seem to be offer the best chance - but remember you need a witness to back up any claims you may have! The bar opens at 8.00 and the restaurant operates daily 12.00-21.00. A pro-shop is also in the clubhouse, with a really good range of equipment from those little things you may have forgotten to bring along, up to club sets and drivers by Odyssey (Callaway), Ben Hogan and Top Flite, or shoes by Callaway. For corporate events there's a small conference room. The club has public changing rooms and showers, however only club members have a number of other infrastructure privileges, such as special dressing and locker rooms, a sauna, pool, and bag storage. Golf packages are available where guests of a number of hotels receive discounts on green fees. The two largest partners are the "Valdemārs" and "Reval Latvija" hotels, but there's also "Metropole" and "Bergs". For the less experienced, there are lessons on offer and Green Card courses with preparation costing € 365 for five lessons for a single person. Apart from high course quality, a great advantage of "Ozo Golf Course" is that it has the closest location to the city center, however this means that it cannot be expanded any more. It's in a semi-industrial area, ten kilometers north of the Old Town. The best way to get there is by taxi which should cost around € 10 and take 15 minutes.